So, I know that most of you are probably caramel apple people. But I mentioned during Caramel Apple Week that I am more of a Candy Apple person, but I’d never made them myself, which is sort of a shame but honestly I’m fearful of recipes requiring a thermometer. Involving thermometers just seems kind of sciencey, which everyone knows I am allergic to, along with sweat, nature, the color orange, and television shows that are supposed to teach me stuff. Anyways — I decided to get over the whole thermometer thing and give Candy Apples a try. I love them, but refuse to go to the Fair (I’m also allergic to livestock and carnies), so I really needed to get a handle on the situation. 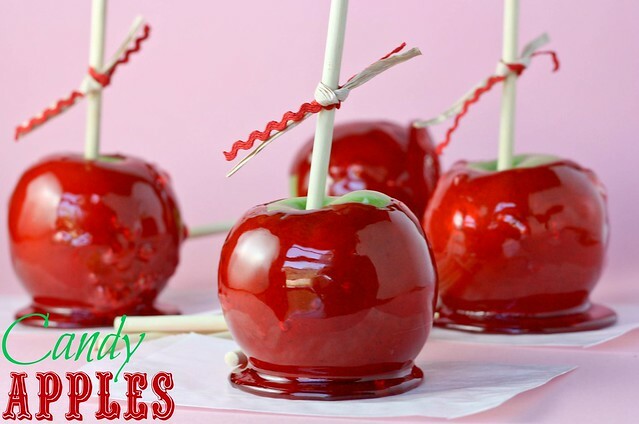 What can be better than Candy Apples whenever you want? Most of the recipes I found online involved melting Jolly Ranchers or Red Hots, which wasn’t what I was looking for. After combining a few recipes and adding a few changes of my own (and burning my hand with melted candy….not a good thing), I came up with a perfect and fool proof recipe. And by fool proof, I mean that not only can you not mess these up, but you should not permit fools to eat them. That would just be a shameful waste. Here’s a cute little video I made to show you just how easy they are! You can do it!! Insert sticks into the top of each apple. Line a large baking sheet with foil and spray heavily with nonstick spray. Set aside. Combine sugar, corn syrup, and water in a saucepan over medium high heat. Bring to a boil, stirring constantly. Keep stirring until mixture reaches 300 degrees on a candy thermometer. If you're unsure about the temperature of your candy, drop a bit in a class of cold water. If it hardens immediately and easily breaks in half, it's ready. If it sinks to the bottom and is pliable, it needs to cook a bit longer. Remove from heat and immediately stir in the cinnamon oil and red food coloring. CAREFULLY dip apples in the coating and place on lined baking sheet to harden. The coating on these is perfect — not too thick or hard to bite into, with just the right amount of cinnamon. Huh..I thought I was the only one allergic to carnies….hey soul sister! Love me some candy apples, but I am always scared they are going to pull out my fillings! do you have to use cinnamon oil? is there other ones you can use? You could use any flavor candy oil you prefer!! Those look PERFECT and wonderful. I always preferred candy apples to caramel apples as well. So lovely! OH my gosh. I just made some of these that are going on the blog tomorrow. Yours are absolutely gorgeous and glossy. The rick-rack is adorable, too! Mmm gotta love candy apples! I am a caramel apple girl, but think tiny apples candied up would be great garnishes for apple martinis….. These look amazing!! They are just so beautiful and shinny and perfect!! 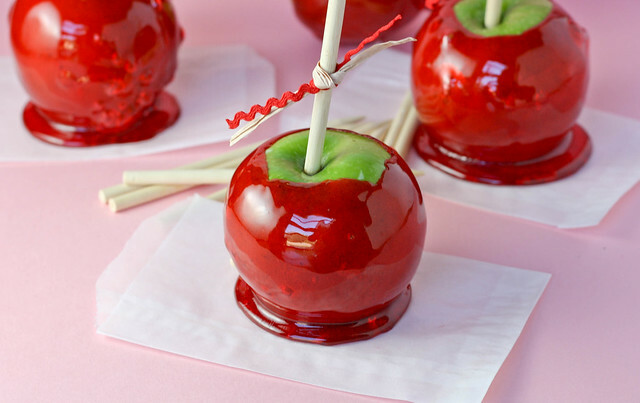 It’s entirely possible I’ve never had a candy apple (I always choose caramel), but these look so good I want to give them a try now! Confession time: I’ve never had a candy apple before. Evah! I know, I know, I am possessed and now your mortal enemy, yada yada. But seriously, I need to try one. You inspire me to do great things with my life, like make these ridiculously gorgeous ruby red candy apples. And love them. as always, these are beautiful!!!! all this time i thought i was the only one afraid of a thermometer! you don’t know how many times i have seen some amazing looking recipes for homemade marshmallows, but, they add the dreaded thermometer in the directions and i quickly look another way. because of you, maybe i will finally go out and buy one!!! hope you are feeling great!!! These are striking! Candy thermometers are scary . I’ve only had a candy apples maybe twice in my ice and although I enjoyed them its not like eating a caramel apple – which I devoured yesterday. Your apple looks wonderful though and sounds quite easy to make. These would be fun to share with the neighborhood kids on Halloween. Love how red these are– look like they are right out of Snow White!! Chris loves these candy apples…Maybe if I was a good wife I would make them for him. I want to lick that pool of candy that’s below the apples! These are beautiful! It reminds me of the State Fair. :D Yum! These are stunning, I just love how shiny and bright the coating on the apples is. Whoa girl – would you believe I’ve never eaten a candy apple? These are so beautiful… too pretty to eat almost! First of all, these are so pretty!! I honestly can’t even remember the last time I had a candied apple, but now I have a serious craving for one! Yay! I’m so glad to find an easy candy apple recipe that doesn’t call for premade candy. I can’t wait to make these. Using a thermometer isn’t really that bad. I’m pretty allergic to science too, but most of my favorite recipes involve the thermometer, like marshmallow frosting. Ok, now I feel like a total idiot. I haven’t actually ever had a candy apple, and I had no idea they were cinnamon flavored. I am really going to have to try one now! Wow, you make candied apples look so easy!! Who knew it was this simple?! I have always purchased my candied apples from the store…NOT ANYMORE!!! These are absolutely stunning. I love that vibrant red – definitely reminds me of snow white! Love that gorgeous color!! Glad to know I can make them so easily at home without having to be exposed to carnies! Can’t wait to try this recipe. I’ve made them before by adding red hots (those little red cinnamony hard candies) but going out tomorrow in search of cinnamon oil. One more thing. I used to go to the grocery store and ask the butcher in the meat dept. for some city chicken skewers (boy am I dating me). They are the sticks with a point on the end. But maybe you can’t find them anymore, because everything is processed elsewhere. Ooo…these are the prettiest candy apples I’ve seen! So red and glossy and perfect! Your apples look amazing! I LOVE red candy apples — could you please send me some — then I won’t have to make them myself? Helpful hint: I’m mad for creme caramel. Easy peasy to make. BUT. One must be super careful when making the caramel — same as making candy — the sugar burn is the worst EVER. From experience I now make a cup of ice water (before heating up the sugar) and put it next to the stove. If anything bad happens — dunk damaged digit in ice water — IMMEDIATEY! I made these for my daughter’s 5th birthday. Needless to say they did NOT turn out like yours. I’m not sure what happened because we followed your instructions bit by bit. The glaze would just run right off the apples so we kept doing it. Also the color was very clear even though we added almost half a bottle of red food coloring. We used them at the party because they look “ok”, but no one ate them so we ended up trashing over 40 apples. I felt horrible. :( Not sure I will try this again even though yours are beautiful!! Love candy apples! If you skip the cinnamon oil do you have to replace with another oil or can you simply omit it from the recipe? 1) Fill your sink with about 4 inches of lukewarm water. 2) Add 1 T lemon juice & 1 T baking soda to the water; swirl around. 3) Place your apples in the water. 4) Using a fruit/veggie brush, brush the outside of the apples. Then, watch to see how gross your water becomes…5) Rinse the apples & pat them dry. Note: If you still notice wax when you are finished, it’s likely because the apples didn’t get scrubbed with the brush all the way around. I noticed this at first on some of my apples, but a second scrub and the wax was gone. Great post! Have you ever made and packaged them? We just whipped up a batch of the cinnamon candy version the other day (B4 discovering your blog). Have to say I was proud at how perfect they turned out. Hard and not sticky. Hubs and I were thinking of making them for favors for a fundraiser but…by next morning all various storage methods yielded a very tacky surface on the candy (humidity, maybe). Any experiences on wrapping ’em up to give away? How far in advance can you make the apples. I’ve never made them before and doing it for a bridal shower. I wouldn’t make them more than a day in advance – they get sticky. This suggests, it will certainly enable you acquire the coins after secs of enrollments Subscribing on binance exchange. I loved your recipe is great, congratulations to the website. Great post, just what I was looking for and I am looking forward to reading your other posts soon. The cakes are great, I like them very much.